Cape Town is frequently ranked one of the most beautiful cities in the world in those never-ending Best of… lists that pop up everywhere. I’ve spent a lot of time here – I know, lucky me – and it’s pretty much impossible to beat, there’s so much going for it. .
It’s scenically stunning and diverse with myriad beautiful beaches, the ever-present majesty of Table Mountain, forests, mountain trails and gardens and some of the most stunning drives you’ll ever experience. It has a warmth to its soul, a great energy and welcoming people. 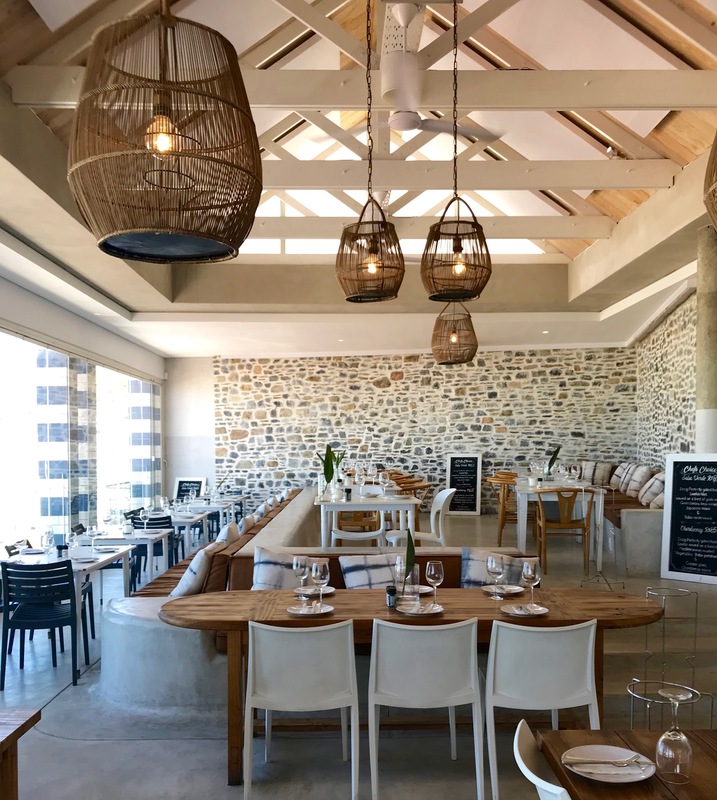 There are hundreds of fabulous restaurants which are great value – and of course there’s all that wine that has to be sampled. I was recently reminded that African penguins live here (I didn’t mention the wildlife yet, did I?) so the purpose of today’s outing was to say hi them at Boulder’s Beach in Simon’s Town. I think I’ve been suffering from penguin withdrawal! Our journey took us from Sea Point to the other side of the peninsular. 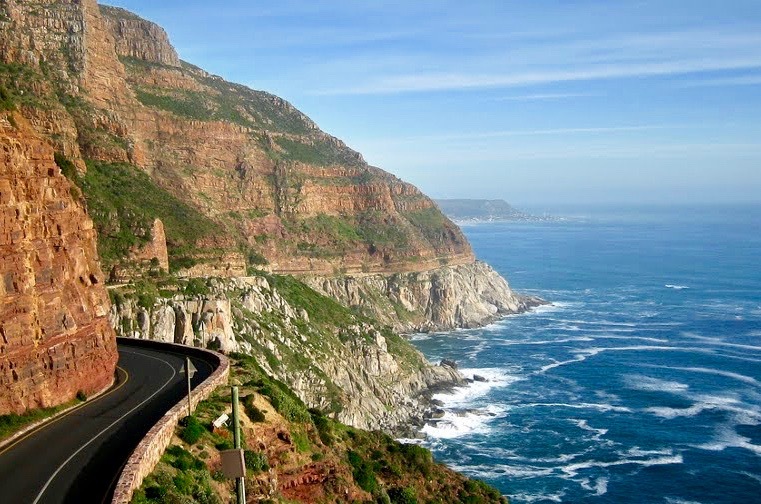 It’s a magnificent drive through Camp’s Bay, past Llandudno and over Chapman’s Peak. The road clings precariously to the mountainside – an amazing feat of engineering – and the sea shimmers down below. 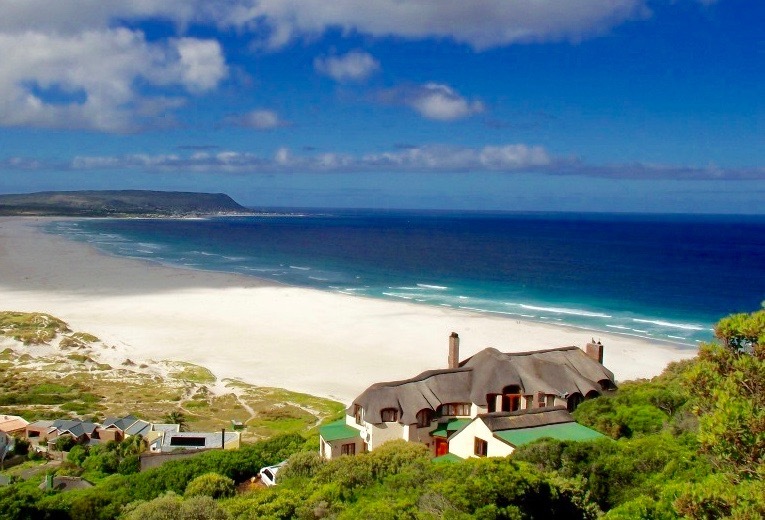 Once you start your descent Noordhoek Beach appears on your right. It doesn’t matter how many times I’ve seen it, and even though I know it’s coming, the view elicits an involuntary gasp. And I always wonder who lives in that house! What a view they must have. Once you’ve crossed over the peninsular it’s a slow meander through sleepy seaside towns to penguin-land on Boulder Beach. Hello little penguins! I felt instantly happier on seeing them. Penguin fix sorted we headed back towards Cape Town Central following the coast road until we got to Muizenberg. 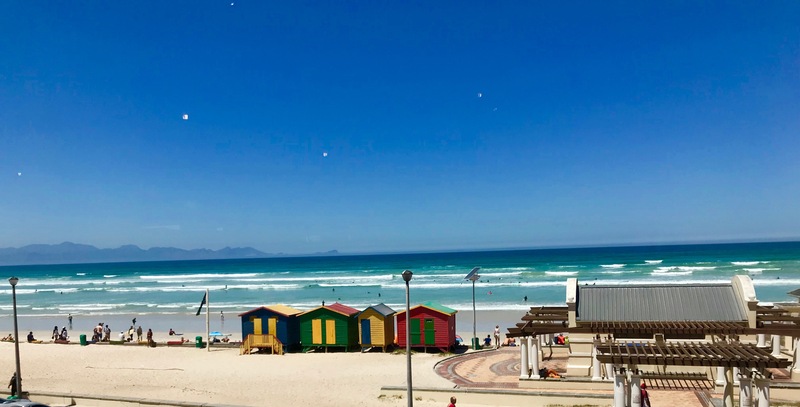 Famous for its beautiful beach and warm Indian Ocean (the other side of the peninsular sits on the Atlantic and is decidedly chilly), Muizenberg is considered the birthplace of surfing in South Africa. There’s a big surfing community here all centred around Surfer’s Corner. Which is where we’re headed – for a spot of beach-side lunch at Live Bait. Live Bait is right in the middle of all the action with a long glass front looking out over the sea. It’s a beautifully blue view and there’s plenty of surf-related action to observe. Inside it has a rustic beach house feel which so perfectly matches the surrounding seaside vibe. There’s a lot of fish on the menu and a great selection of sushi which is freshly made in front of you. Our delectable light lunch today started with a portion of Thai fish cakes to share. Shaped more like fish balls, they were lovely and light with well-balanced Thai flavours and a nice crunch. 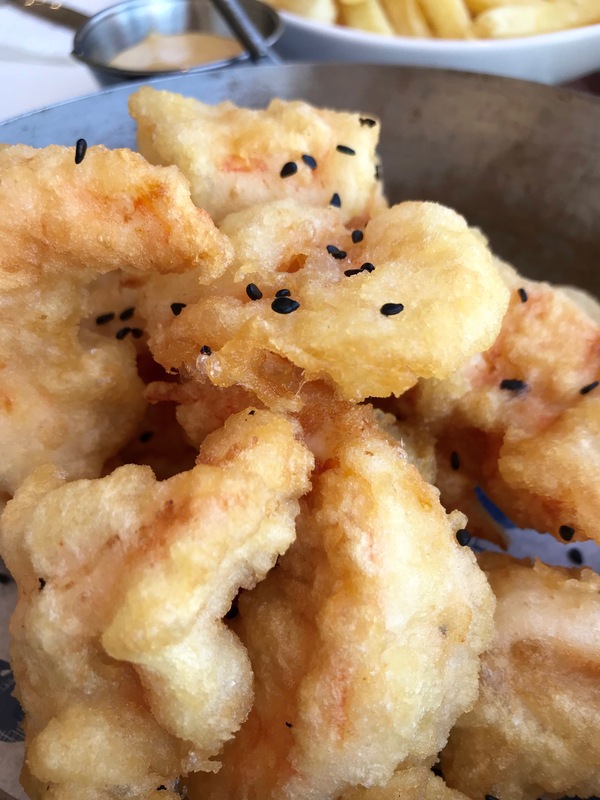 For mains we shared a portion of tempura prawns – and a very generous one it was, too. 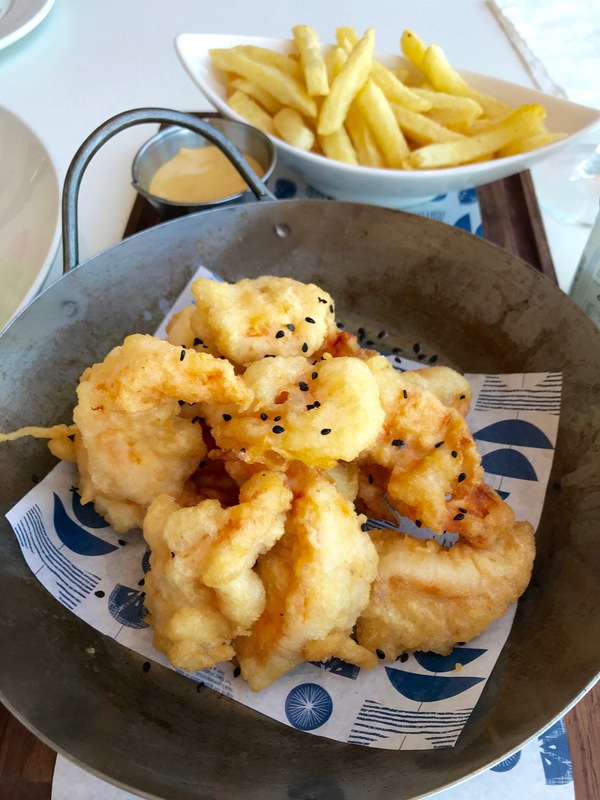 Served with crispy fries, the prawns were perfectly cooked in the light batter and served with a dipping mayo. We asked for some chilli and mixed it into the mayo, making for a delightful spicy hit. 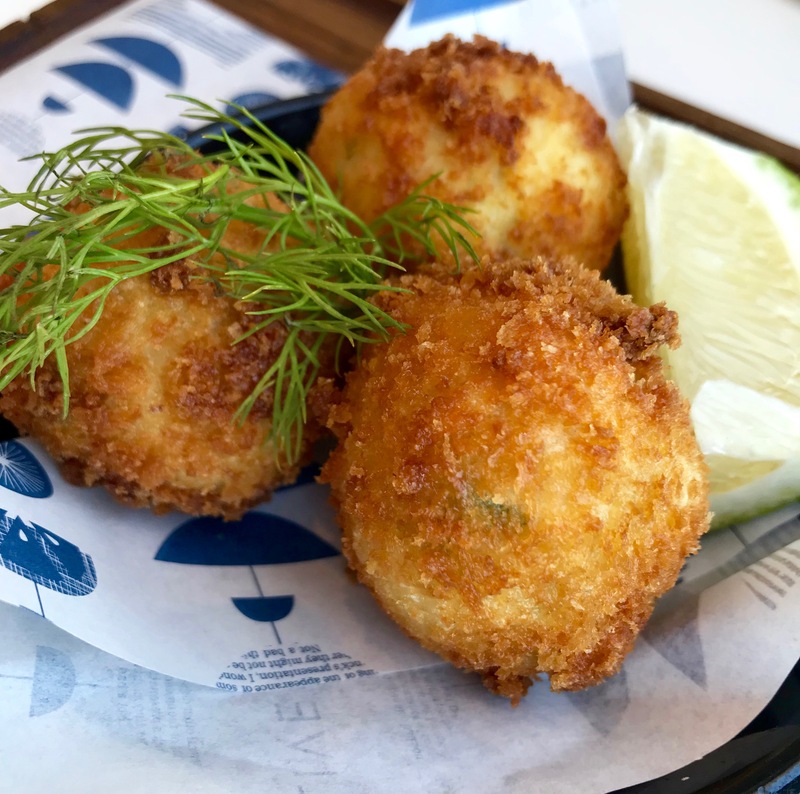 There’s a relaxed vibe at Live Bait, it’s the sort of place I could see myself spending many an hour drinking wine, feeling fine and absorbing some of that Muizenberg chilled-out surfing attitude. This is your sea view. Which goes on much further on both the left and right of this picture. While Muizenberg is great for swimming and surfing, it’s also home to Great White Sharks (more wildlife)! The area is well monitored though with shark spotters on high and at the beach who seem to know where the sharks are. I’ve been on the beach when the shark siren goes and it is a bit of a scary experience if any of your party happen to be in the sea. That Jaws music creeps into your subconscious! There are experts on hand to tell you about these powerful creatures and there’s plenty of shark-related advice posted all over the place (in several languages). 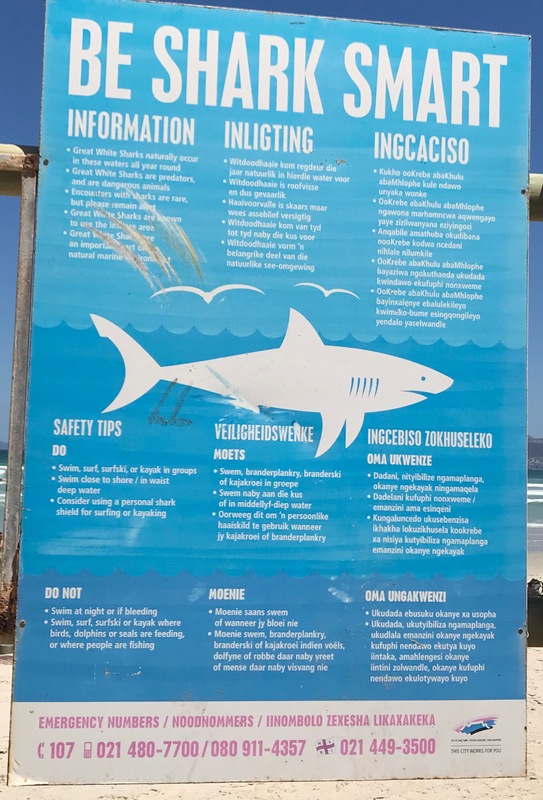 Like how to be shark smart – do remember not to swim at night or if bleeding! The presence of the Great Whites certainly adds to the Muizenberg adventure. Oh and before I go, here I am with my latest penguin friends. I can’t imagine there’s another journey more filled with beautiful views, lovely food and exotic wildlife. 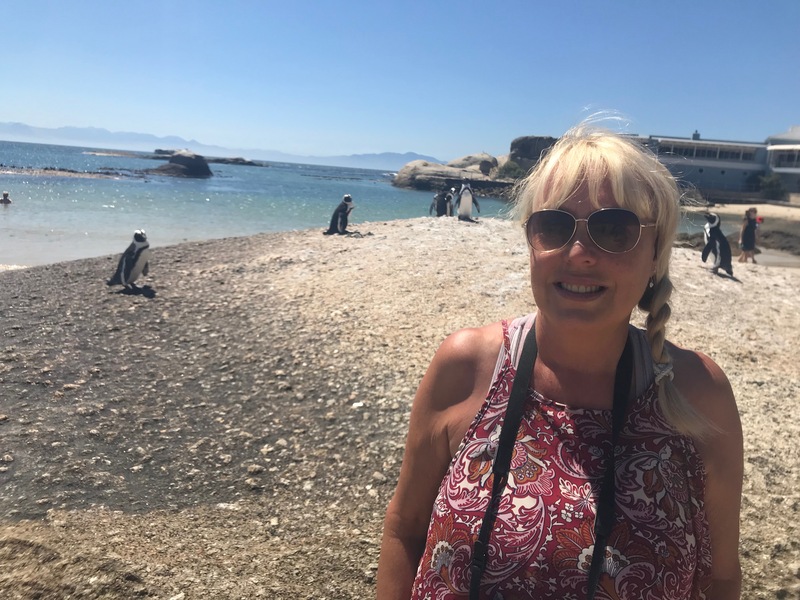 What joy – Cape Town I love you! All conversions are at the today’s exchange rate. Wow!! I need to go to Cape Town! I’d love to see penguins and eat at that restaurant. I love the white, blue and brown colors. Great article! I’ve been wanting to visit Cape Town ever since I received a postcard from there as a little kid. Your post & pictures are just urging me to visit even more!! Great article and pictures, Sandy. I still think Cap Town is the prettiest place I have ever been to. Send the family my love! Thanks so much, it’s such a beautiful place it’s really hard not to take good pictures! The seafood was totally delicious. Thanks Becky, it is totally stunning. Love it! Will pass on your love, same back to all of you. Make a plan! You will absolutely love it, there’s so much to do and it’s really welcoming and chilled. Plus the food is awesome. Thanks Loral. You really do need to go to Cape Town. 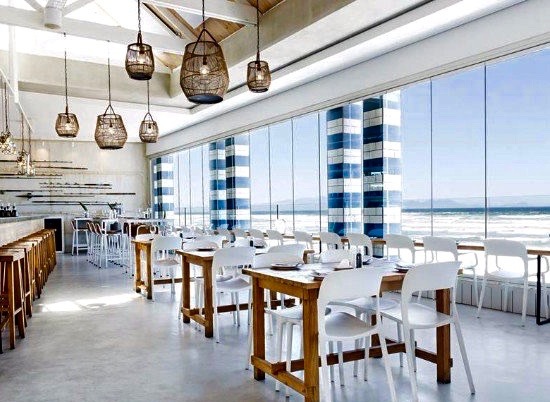 There are many restaurants to choose from, I love this one because it has such a beautiful view and the beach-house feel inside is my kind of design. Oh and the food was lovely too. Omg aww! Thanks for all the Cape Town feels. I really miss this place and I can’t wait to explore more based off of what you share! Only a pleasure, it is such a stunning city, I love spending time here. If you do decide to explore more, get in touch and I can give you some insider tips! There are so many beautiful views in Cape Town, you would love it. I’ve never done shark cage diving – you are a braver person than me! Thank you so much Wynee, it is such a beautiful place.